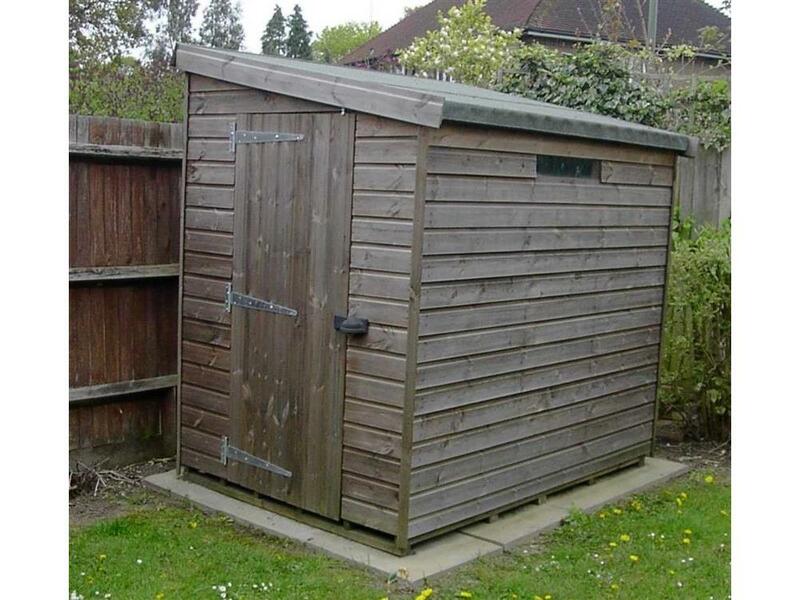 Don't forget, you can change any part of your shed, we've just started you off with the typical Tanalised Shed set-up! Tanaliased so won't need to treat it for years. Wish I had bought a slightly bigger one. Very pleased overall. The customer service was brilliant and the installation was quick and easy. 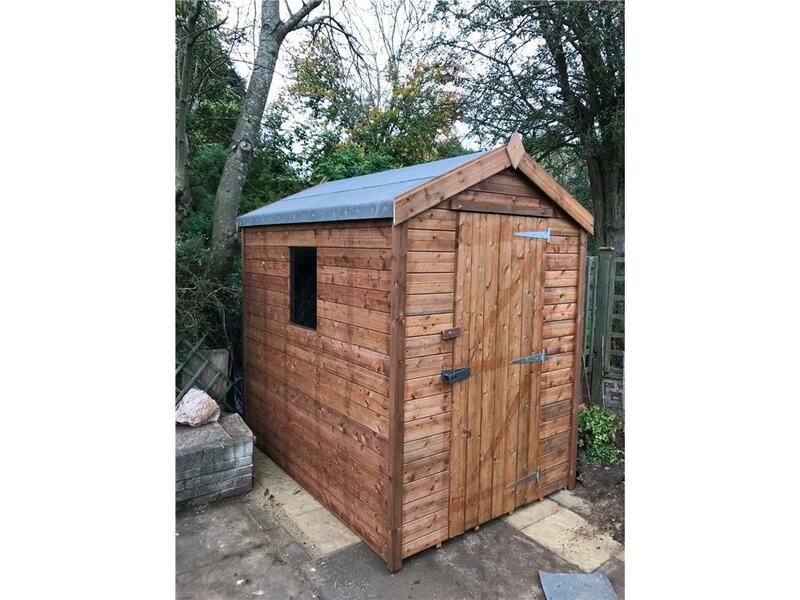 I'm hoping not to need a replacement shed for a few years so probably won't be a returning customer, but would definitely recommend to others. Sturdy, and spacious for such a small shed. Having my garden landscaped so needed a new and larger shed to go with the new garden. Beast shed looks great and well built. Delivery was on the day specified and the guys worked hard to have it up in about two hours. Everything was as ordered including shelves and double doors. Well constructed and good looking. Could do with another bolt inside at the top of the doors. My whole experience from start to finish was exceptional, would definitely recommend this company and their product. Everything was easy from their website page to the delivery men. The shed itself was fist class, good quality and also looks good. There wasn't anything I didn't like about the shed. A great shed and a company who gives 100% commitment to their clients. The service from easy shed was great, the website made it easy to chosse the right shed for our garden, and when it arrived they guys built competently and speedly. Have the tanilised options is great means never having to paint it! Price was high but i hope time will prove it's worth. Good website and commuciation and good staff. We were looking for a shed that we could use as a potting shed. 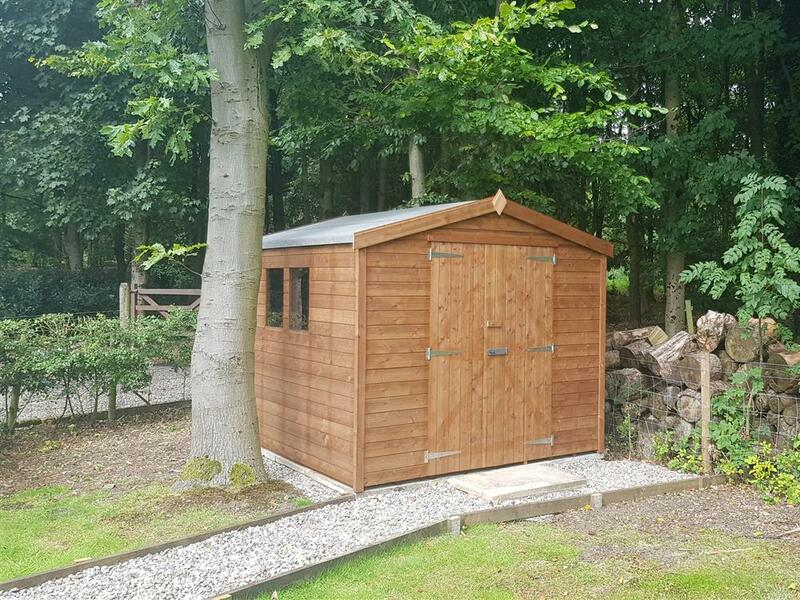 Before ordering a shed we knew that we wanted the shed to be delivered and installed for us and so did a lot of research on the internet before deciding on EasyShed. Customising the shed to our requirements as part of the order process was very easy using the EasyShed website. 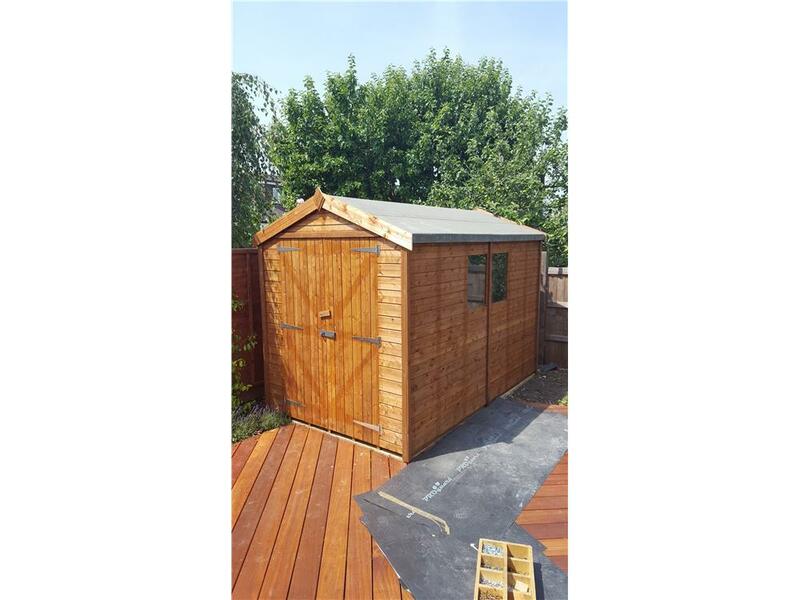 The shed was delivered and installed as per the agreed time and date, and was completed very easily. There was a minor defect in one of the walls of the shed which following communication with EasyShed the wall was quickly replaced. We would thoroughly recommend EasyShed. . The shed is well constructed of good quality materials. The customer service has been excellent. Happy with the quality of the shed and the customer service. We are so pleased with our new shed. 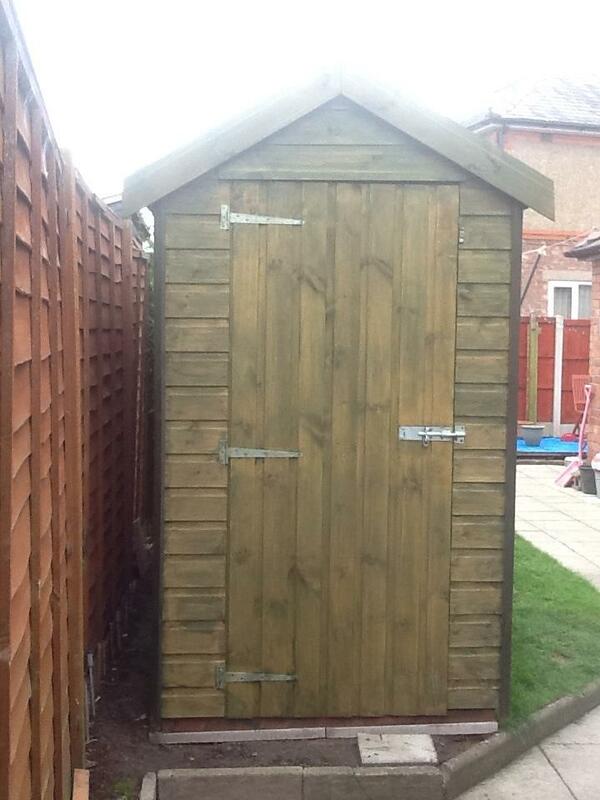 We were apprehensive about ordering a shed online without seeing the quality first but should not have worried. The shed came on time and it's perfect. Wish we had ordered it long ago! We had a new shed installed and would like to say how pleased we are with it. It looks superb. I would also like to say thanks to the guys that installed it, they were first class, very friendly and polite. Really happy with the service from the beginning they were informative, efficient and quick with the whole process. Even putting it up effortlessly. Very stress free process. the fact it is tanalised. i dont have anything to do for many years. The web site was very useful in helping me to make my choice. Ordering on line was easy and quickly confirmed. The shed was delivered on the day I was given by telephone after placing the order, and the installers were quick and very thorough. Since installation there have been no problems, and the shed has met all my needs admirably. Thoroughly recommended! Exactly as ordered. Needs no maintenance. Some condensation inside during the very wet weather. A very good shed, good value, carefully installed. It was a happy chance that I found your web-site, which I found to be informative and easy to negotiate. Your sales staff were courteous, bright and helpful. 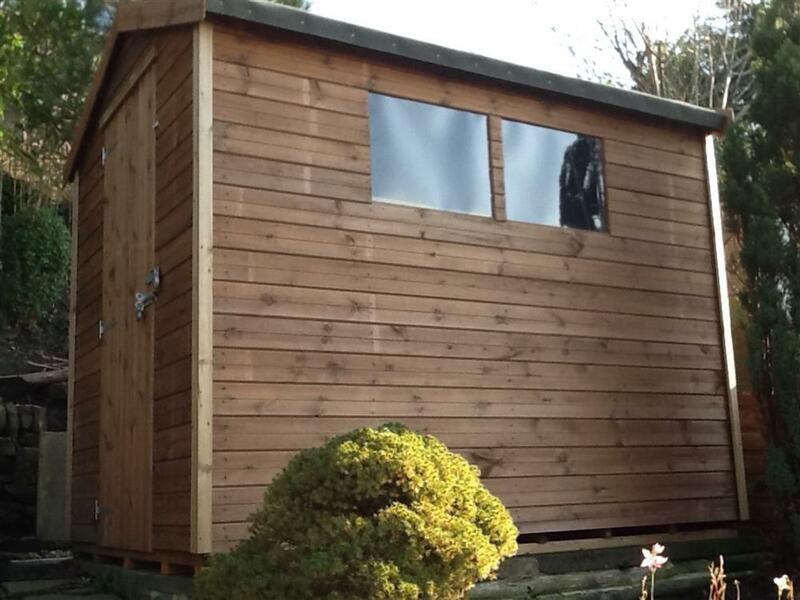 I never thought that buying a shed on-line and, subsequently, over the phone could be so stress free! The shed has taken all that a very wet and windy winter could throw at it and still looks and performs as if it was only erected yesterday. What more can I say! Surdy construction, special floor, quality materials and rot protection. Quick, efficient erection. A quality operation from start to finish. 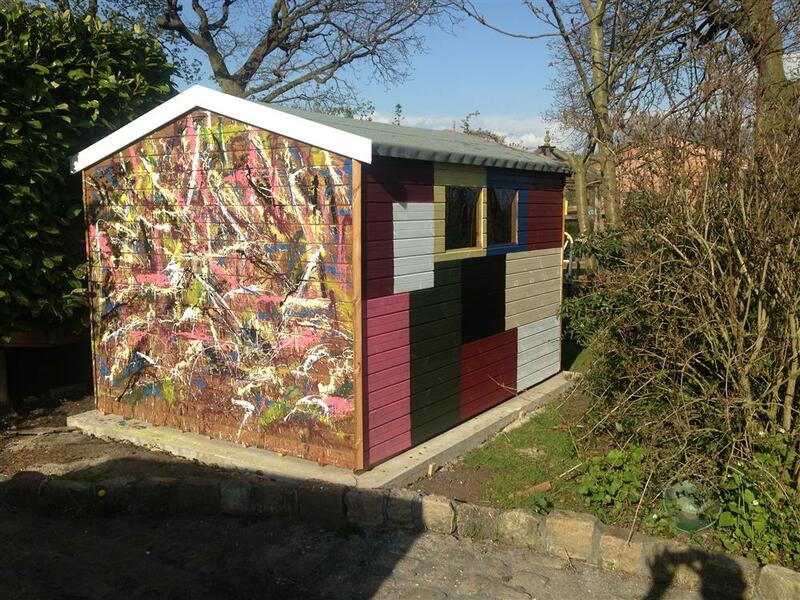 We bought the shed for storage of a new Youth Club's equipment as the "inherited" one was a feeble featherboard-clad shed. The purchase feature-selection process was easy; the delivery on time & the assembly by the two guys smooth & trouble free. A great purchase which gives total confidence in its security. A good purchase: got what we paid for. Want a REAL shed? Look no further! These guys are amazing. The whole order process was easy, and I got a whole lot of help by email (complete with drawings each time!). The delivery was spot on, and the guys who assembled it were fantastic. The quality of the shed? INCREDIBLE! I could not have hoped for any better. 10/10. True value. Great value, great product, great quality. 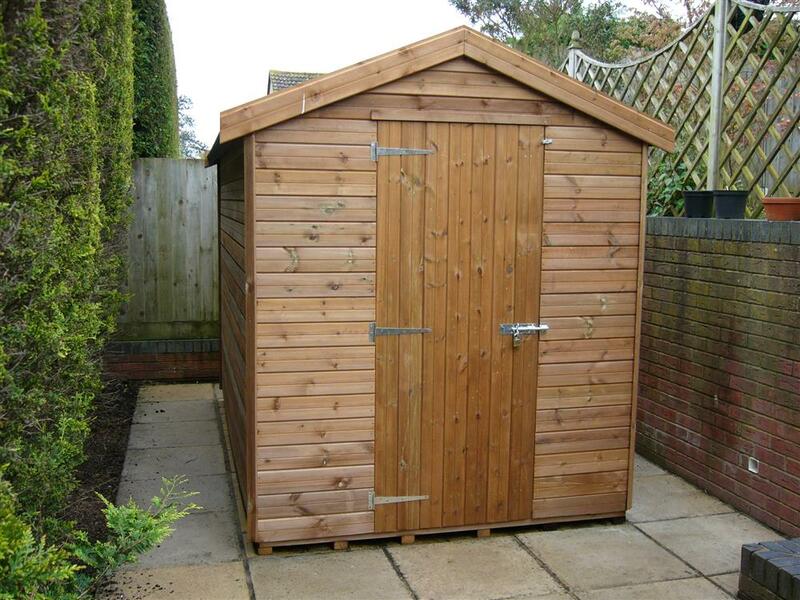 The website makes it really easy to specify exactly the shed that you want. From thereon Easyshed take care of everything. They let you know when the shed will arrive, they turn up when they say and they erect the shed in double quick time. What's not to like! Had a difficult space to put a shed. Particular difficulty was need for shed 9ft long. Most other providers do not have 9ft option available. Shed was ordered, delivered and installed vey efficiently. Size - 9ft option available. Door began to droop. I have had to replace the door bolt retaine twice..
Website was good and very pleased the shed arrived and was erected on the day arranged. I am pleased I paid for the tanalised wood as it is very good. 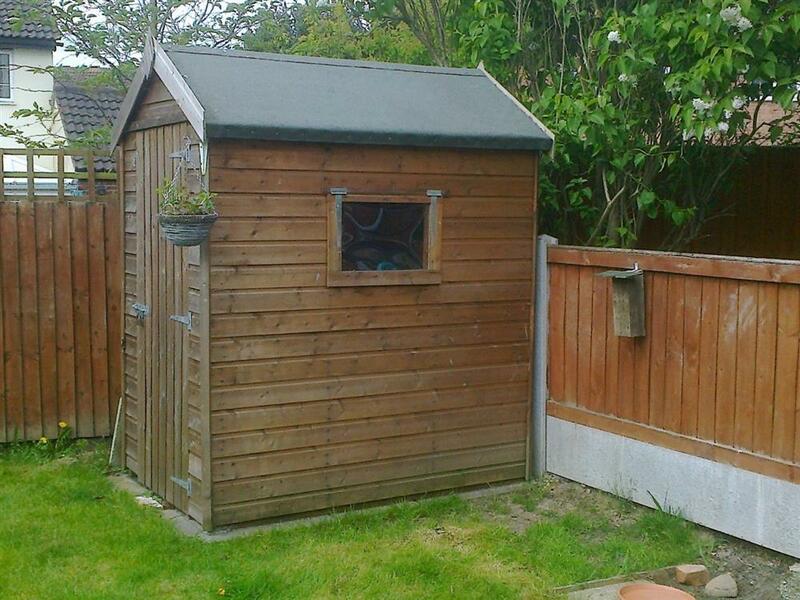 A classy shed, a great match for our garden. Follow up after the sale right up to the delivery day was excelent. Excellent customer service, delivered on a day that was suitable for myself and the 2 guys that delivered and erected the shed were great. - great company to deal with, would recommend to others. The website with all it pictures and shed builder wizard was great to use. The delivery/construction men worked very fast. Sadly there had been a mistake with the panels supplied and so they had to come back another day to finish the job. The tanealising is a great feature and the shed is of good strong construction compared to the previous one. Excellent service from initial advice to efficient delivery and erection. Shed is sturdy and also looks good. Best price for tantalised shed that I could find. 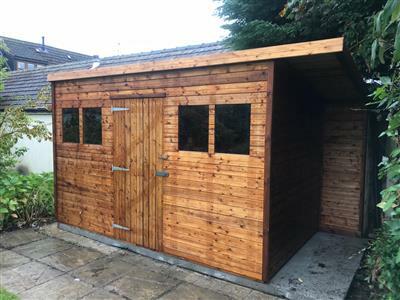 Had to call Phil at Easyshed to verify some details on the web during the ordering of the shed and he was incredibly helpful, knowledgeable and a pleasure to speak to. He made ordering the shed very easy. The shed turned up on time and the lads who put it together were quick, quiet and efficient. We are really pleased with the shed ('workshop' as its now known) and it is the envy of many, if not all, of my husbands male friends. Brilliant shed delivered and and erected as promised. Wanted to jazz it up a bit though! Super shed. Sturdy and well made and just the job for all those extra bits and pieces its difficult to find a home for. Delivery and installation was quick and efficient too! Thank you so much to the guys at easyshed they made it so simple from deciding what to have, ordering, paying and delivering and erecting. Andy and Norris you were brill. Will definitely be reccomending you to my friends. Thank you so much. Easy order process - helpful staff answered all my questions via email. Delivery and erection was arranged to suit me and the two lads arrived at the time they said they would. 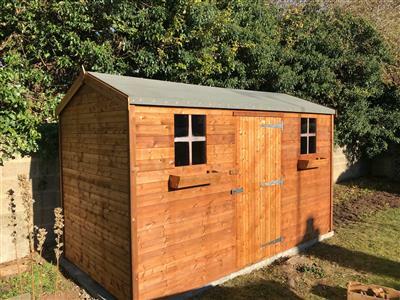 They got on with the job of erecting the shed quickly and efficiently, depsite the awful weather and the slightly awkward site, and left a great shed and no mess. Happy to recommend Easyshed! Great size shed. Fits perfectly in our small garden and not too overpowering! Great quality shed. Very sturdily built and looks good too. Exactly what I wanted. My shed was easy to order, delivered in a timely manner and notice was given by telephone as to when to expect delivery. The shed was erected by two very professional young men who quickly assessed the tight site and built the shed without any fuss. I am very satisfied with the shed and the way the sale was completed. I love my shed! It fits exactly in the space that I have. Wide door at no extra cost is fantastic. Sturdy construction including floor - great as it's in quite a damp place. Ventilation gaps are a really good idea as feel confident that I can store anything in my shed. Came when they said it would and the 'shed technicians' ;)were very helpful and thorough. Received many good comments from neighbours about shed. Cannot fault. I'm really please with my new shed it has an excellent build quality and the fitters did a good job of the build and position. Thanks Easyshed I would definatley reccomend you to others. FANTASTIC SHED, PRICE & SERVICE. THANKS SO MUCH. My husband is very pleased with the shed, it arrived within the week I had ordered it. Does what they says etc., good value for money, easy to maintain, looks good, thanks. After doing lots of research I finally bought a shed from EasyShed. They weren't the cheapest but they definately offered the best value for money! 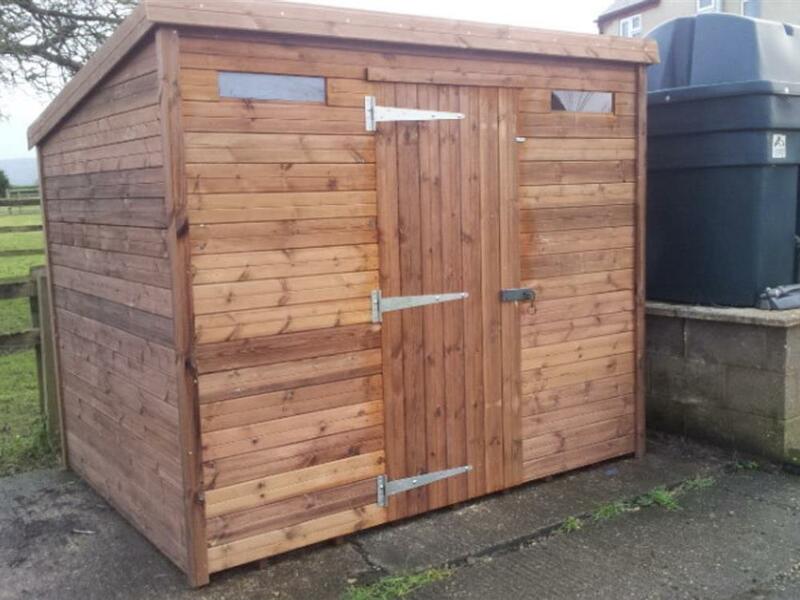 A top quality shed with Free Fitting and Delivery and a Free Tanalised (rot-resistant) floor and framework! I couldn't find a better deal! Plus I could customize my shed to my hearts content. So my shed was exactly what I wanted, it was put up properly and I know it'll last for years! Totally top notch company, very helpful and friendly service. My wife is happy now I've got a shed to go to, keeping out her way! Shed top quality thanks! As good as a garage. I store my motorbike in mine and I know it's safe in there! Recommend this shed to all. 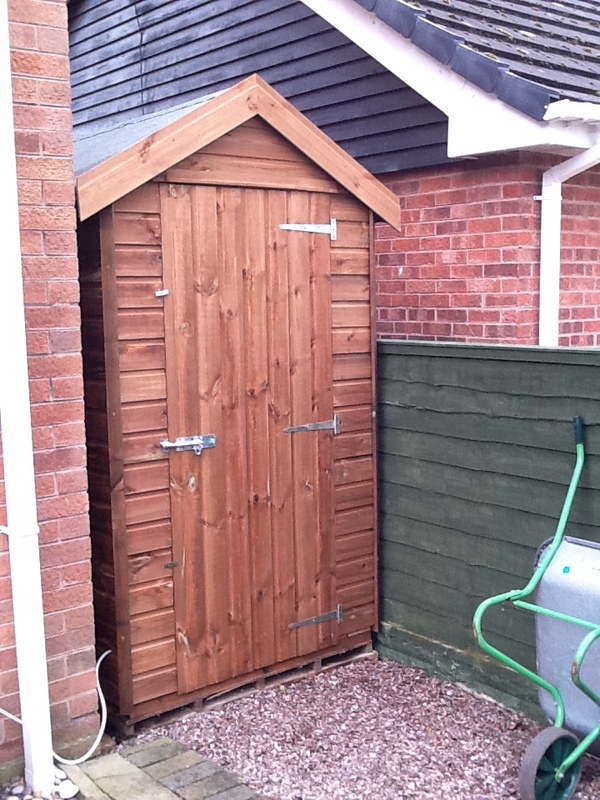 Compliments the garden really well, fantastic storage and alot nicer than a standard shed! I've had a few sheds in my years and this has gotta be my favourite! Construction is second to none with a really solid feel. I wanted a space to use my work bench and vice - which is a heavy piece of equipment - the shed can definatley handle my DIYing! Thanks for the great service. The shed is even better than I expected! Great shed. Erected on a difficult site without fuss.Top notch suppliers. Excellent service delivered in a matter of days, Cheers! Arrived when stated and is good quality.Cheers guys - top job! Great service and communications. Got home and there it was in the garden! Very nice people, very nice product, easy transaction. Thank you very much. EXCELLENT SERVICE. EXCELLENT ADVICE. NICE TO DEAL WITH. Thanks! Excellent shed, good communication and very helpful...will use again! 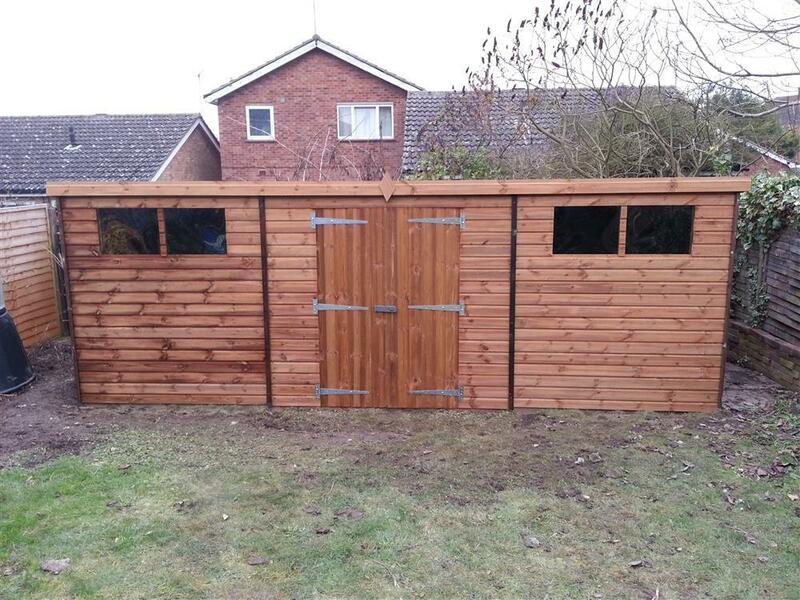 I did a lot of checking around and you might save a few quid on a shed the same size, but you won't get the same quality and you certainly don't get free delivery AND fitting from anyone else! The time this saves you, is worth every penny! Delivered and fitted within the week! Excellent customer service and top quality shed - very happy thanks! Hard working, honest company. Shed is good quality and erected quickly, v happy. Having read previous comments, plumped for a summer house from EasyShed, and it's a great little house. Thank god they fit it because unless you are super handy with a tool box like my hubby, it would be a challenge to put up! Looks great, having looked at absolutely everything out there, it was the best for the price and we are very happy with it.